Environmental awareness starts within our everyday operations. We have high standards and our goal is to offer the highest quality of service we possibly can. 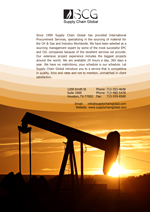 SCG’s proven supply chain solutions help you reduce operating expenses and maintenance costs. Keep your land based or offshore drilling rigs productively running night and day by relying on SCG’s expert service and quality products. SCG’s long-proven, well-earned reputation of on-time delivery and integrated communication with rig personnel ensures your project is done fast and is right the first time, every time.